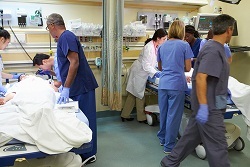 A new hot topic in medical malpractice is infection cases. A Pennsylvania woman who allegedly contracted a staph infection which that resulted in facial scarring while she was working as a prison guard at Graterford Prison in 2003 settled her claim or $226,000. Alas, this was a not a medical malpractice claim but a workers’ compensation claim against the prison. You can read the full article here (since removed, sorry) which includes a picture of the scarring. Obviously, a successful medical malpractice claim would have resulted in a larger recovery of 90% of the time. Proving a workers comp claim – that the staph came from the prison – will generally not be that difficult for an evidentiary standpoint. The hard part of a hospital staph infection case is proving negligence. Infections are a big problem. The CDC tells us that 1.7 million patients nationwide will get an infection during a hospital stay and 99,000 of those people will die. That is nearly 300 people a day. This is more than car accidents and AIDS combined. Why is it not a bigger deal in the national media? Most of the victims are old. That is the reality. Treatment of infections cost our strained healthcare system over $30 billion a year. A big infection problem is staph infections. The CDC also reports that 85% of all invasive methicillin-resistant Staphylococcus aureus infections are in healthcare settings, such as hospitals and nursing homes. Some courts have gone as far as to say that a hospital-acquired infection is an “accepted risk” of hospitalization. But this is crazy. Hospitals have consistently different rates of staph infection. So we know that precautions and following the standard of care matter when it comes to stopping staph infections. In Pennsylvania, which is the origin of this post, through CDC-supported efforts in Pennsylvania, some hospitals have successfully reduced infections by 70% by implementing CDC prevention recommendations. Infections are not just something that just happens. But the problem for victims is that it can happen in the absence of negligence. So victims or their families must show how the infection occurred. This can be a challenge in many cases.